Preheat your oven to 400 degrees with the rack in the middle. Combine the oil, onion and 1/2 tsp salt in a large saucepan. Cook over med-low heat, stir often, until the onion is soft (about 8 minutes). Mix the garlic, chili powder, cumin, sugar, and tapioca starch in with the onion for about 30 seconds. Stir in the tomato sauce and water. Reduce heat to low, cover and cook for 10 min. Add the ground beef, jalapeños and cilantro then season with salt and pepper. 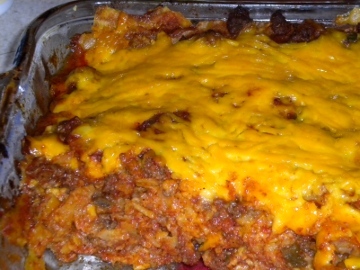 Spoon the meat mixture into a tortilla shell, add cheese, roll up tightly, lay seam side down in a 9×13 pan (sometimes I add black beans too). 12 tortillas fit in one layer. Sprinkle sauce and cheese over the first layer, then repeat with the next 12 shells. Cover the top with the left over meat mixture and the rest of the cheese. Cover the dish with foil and bake for 20-25 minutes. Uncover and bake 5 min longer.